Kellie H I have seen in a vision about six years ago, the plates shifting under the coastline by California. God showed me it was going to massive. The entire coastline from Alaska down to Mexico was going to be destroyed, and a part of California that juts out to the West on the ocean will be completely swept away. God gave me a sign to look for before this happens: shark attacks. Sounds strange, I know, but sharks hunt by vibration, and they will actually be sending the plates shifting, and not their pray. This is what will cause shark attacks to occur in greater frequency. Jesuslives forever i had a vision of a tsunami due to an asteriod.. an angel took me flying above an ocean where the impact wld take place.. the angel didnt tell me when.. but the angel told me, ” Soon it will happen”, and to prepare with food and water.. i saw the tsunami which looked like the east coast somewhere.. i was then transported what looked like the west coast and saw the tsunami there too.. the angel again told me.. “Soon it will happen, soon it will happen”! !..the asteriod impact will cause tsunamis all over..
Kimberly Miller Iarranaga I had a dream around 3 years ago or so, I was in Corpus Christi and my family was on a boat on shore in the bay, I’m not sure why but I had a panic in my heart that something was going to happen, and begged them to come with me to take shelter. We ran to a convenience store and we just made it inside when I turned and looked out the door the biggest wave wall I had ever seen, at least 20 stories high was coming at us, it crashed over the store, but I had peace, and I looked at the tv inside the store and it had a weather map of the US with all three coastlines outlined in red, all coasts were hit. I went to the door only to see that the wave caused no damage, I went out and found two teachers on a bank along the bay, I had asked them if they had seen what happened, they hadn’t and I looked and off in the horizon another wave was forming and I pointed at it to show them what had came is now coming again. Monica Drake I have had dreams of tsunami’s as well. I do have the prophetic gift on my life, but I am a babe in this area, because I ran from these things for so many years and didn’t keep a record of everything. But the dream I had about a tsunami was as though the tsunami was being held back by a group of people I know who have a definitive prayer life. It was as though the waters were forming a wall and couldn’t proceed any further because the people were praying. On the other hand I have been urging people in my area to pray, but I’m not sure many people are listening. Holy Spirit led me to start a prayer call for Saturday nights and my family isn’t taking heed. I just continue to pray that people will wake up. 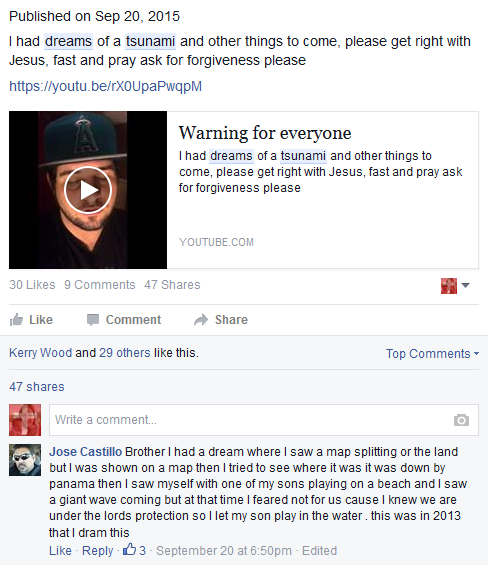 “On the night of May 17, 2016, I had a dream/night vision in which I was shown the tsunami that will strike the West coast of the US, as a judgment from Father on the United States. It was very short, but very clear. There were many people on the coast, and as I looked out to the horizon, I suddenly saw the waves approaching. Father confirmed that this was indeed the tsunami that will strike the California and the NW coasts. He told me to warn the people. Callene Reese I have had several of these dreams in the past year. I saw rushing waters heading straight at the Whitehouse in one dream and I have dreamed about a Asteroid hitting the earth and shooting in 4 different directions. I saw a metor shoot over my head toward Miami and a great Tsunami was coming toward Orlando, Fl., and I hear in my spirit get to Gainesville, and I just remember calling all my family pleading with them to leave now and head to Gainesville, Fl. James Allen I had a tsunami dream a month ago… There were three consecutive waves hitting minutes apart. The first wave was at knee level, it hit and flowed around me. The second wave hit and flowed over and around me (10 feet high). The third wave was 10 stories high and it went over and around me. I was safe and I felt no fear for He was with me. I was sad however, so many were swept away. ELIZABETH SILVERHAWK I have seen tsunami hitting us in the west coast too its scary what is scarrier its that it happens at night 🙁 lord have mercy on us on his wrath. Elaine McKinney Simpson I have been given Prophetic Dreams since I was gloriously saved. I had a Tsunami recently. The eave was so close to shore. It appeared to be 30 stories high. I saw it cresting over. I was screaming “RUN!! RUN!!” . My 16 yr old grandson has Prophetic dreams. He is saved, prays, loves God and is pure. He had s dream that a Tsunami hit the entire East Coast from New York to Florida. He said the wave looked to be 1000 feet high. Helen A. Johns Linker My mother had a dream in 2000 about an upcoming earthquake/tsunami on the West coast, where CA fell into two sections into the ocean. Nile Milton I had a Tsunami dream before I left California back in 2009. The dream I had went like this. : I was in the White House of the United States of America and it was empty there was a red emergency phone in the corner and the phone had a red light on it and it had no buttons on it or numbers the phone was only set up to receive incoming calls but no outgoing calls could be made from this phone. All of a sudden this red emergency phone in the presidential office began to ring and the red light started flashing. 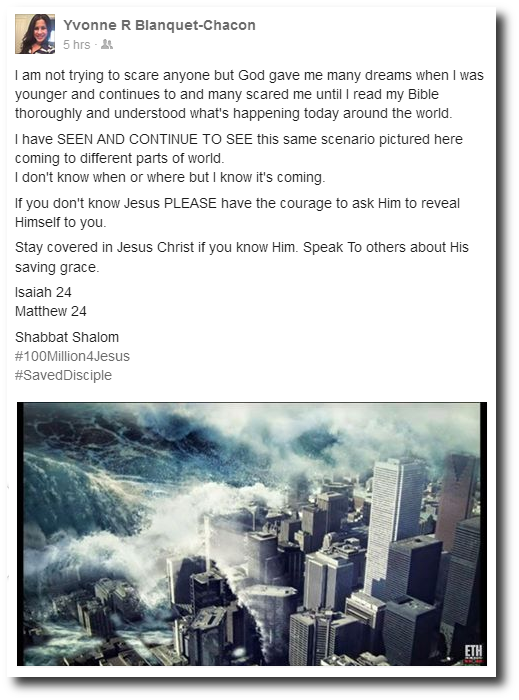 I picked up the phone to answer it and a strong powerful voice came through the phone and it said, “Thus says the Lord a Tsunami is coming I repeat a Tsunami is coming! GET UP TO HIGHER GROUND! !” Right after this message came through the phone I saw myself and some family members in California and the angel of the Lord came to help us get up to higher ground. As we were making our way up to higher ground for safety I began feeling like we should warn others but when I went to do so the Angel of the Lord said “Do not tell them for they have been warned many years in advance and they will not listen to you for they are a stiff necked people. If you tell them they will stop you and your family from getting to safety so do not I repeat do not tell the people just get yourself and your family out” After that we made it up to safety on a high mountain. After having this dream the Lord moved me and my family out of the state of California and I’am so thankful he did. This dream is 8 years old so I can see why the people won’t believe it because it hasn’t happened yet so this is why the Angel said not to warn people who will not listen anyway. Thankful for the warnings God gives us. Right after that he helped us get out of the dark state of California. He that has ears may you hear what the Spirit of God is saying. Kristen Bell I’ve had a vision in the last year of a tsunami and lots of quakes coming to America. The outlined states no longer existed and New York was gone along with California and I was able to see the USA from way above and all the outer lined states were grey and smokey looking. I don’t know what all this means but as I told my paster he had a similar vision and my husband had a vision of a wave that was coming inland and another wave met it and they collided creating chaos. I haven’t had another one as of yet. Tracey Cobb Mine was a fireball coming down across the sky….no date or time. The sun was out and it was daylight. This was the second in my life that I have seen this and I was just waking up, not sleeping. Only the Lord knows what is going on or what is coming. Irene Herring I saw this many yrs. ago about the West Coast.. When they were concerned a few yrs. back that a tsunami would hit and it ended up as medium waves. I said thank you God and his response was: that is not the one I am showing you..,I asked my husband how high is the tower he said around 200 ft. I have that in my mind that the tsunami will be that Approximate height . 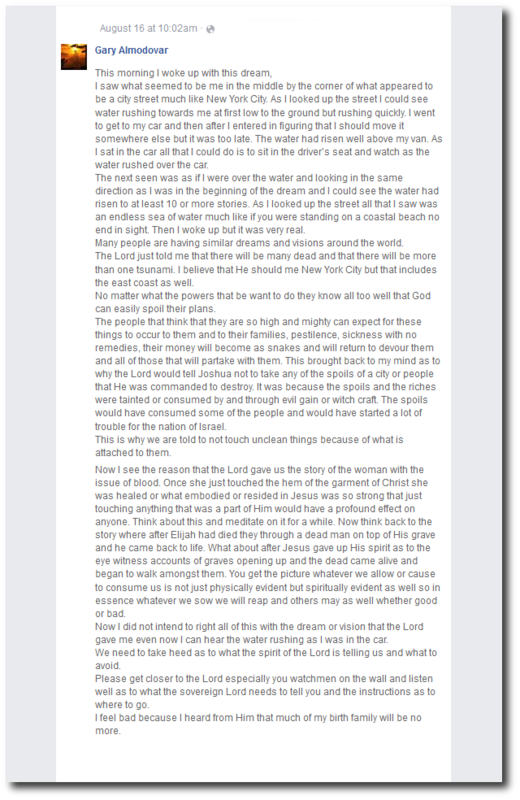 My friend saw the golden gate bridge crash in the water. Carole Brown I’ve had those dreams about climbing higher and higher, then turning around and everywhere I look the water is rising higher and higher! I also dream about fire coming out of the sky, and people running everywhere trying to hide. Big explosions everywhere and so much fear all around. Jesus, is coming soon! Demetrius Moss I had a dream about a tsunami about 4 years ago – I live in Los Angeles…it was so terrifying that it took days for me to get over it…I was in the house with my friend and looked out the window and about a block away I looked up and saw like a 100 ft wave- it covered the sky line it was so big….it was scary! Marlene Beck I may not have had a Tsunami dream recently but, I have monitored the USES earthquake data for going on 11 years now. There have been earthquakes recently in places I have never seen them before, Pennsylvania, new York. Alabama, Kentucky. Also the tectonic plates around the ring of fire have all had a release of pressure of 5.0 or greater except for 1 area….off the coast of California, Oregon, and Washington state. This means a tremendous amount of pressure is building up in this area and eventually it is going to have to give. Weather it be now or in the future it has to happen. Either by earthquake, or volcanic eruption it just makes sense. I pray there will be some type of warning. Sheri Kelly Riley John Paul Jackson also spoke of tsunamis that would hit on both coasts and change the shape of the country. Donna Faye My son had a dream of a tsunami coming in from the ocean, he was on a long bridge, like the Golden Gate Bridge in California. He tried to warn people but the big wave rose up high toward him and he said, “it’s too late” then he woke up. Cory Mobley A few years ago I had a dream of an asteroid hitting the Pacific ocean, between southern California and Hawaii. Debra Faw I had a dream about one on the east coast, specifically in the coastal town that I live in, NC. However, there was no fear associated with it. I’ve also had several dreams of water covering all of the roads around here. All have been within 12 months. Victor Rodriguez I live in central Ca. There is a mountain range that divides where i live and the Central coast. I dreamed about 5 years ago the central coast was taken out by ocean water. From my house i could see the top of the water as if the mountains were the new beach area. Emmelyn Bliss Harris I actually had a dream of a tsunami several weeks ago. I only remember that my husband and I were standing on the bank of a river , not a ocean and the water was red. I watched the wave come in and it just kept getting larger and larger. Donna Wms-Robertson Several weeks ago. I woke from two dreams. First one, I came home to see many people in our home not knowing any of them. My mother was entertaining but I did not know the people. I made them all leave. But my mother was not my mother in character. I was suddenly taken to the boardwalk walking by myself and I saw a very large missile about to hit the ocean. I ran but had a massive weight on my back. I slung the weight not seeing it and ran up to a large brick building where the door was about to close. Once shut, I saw lots of black haired children and myself who has been saved. I saw a missile about to hit water but there’s no way I could have survived. To this day, I was certain, I was there in body. Michael Red I’m a canadian. Early this year I had a vivid dream that my wife and I stood somewhere in the u.s. In the dream I could feel and tell that I was near the west coast and there were piles of people everywhere. I sudden to heard the loudest noises I’ve ever heard. A gigantic burning rock came out of the sky and saw it for a split second before it hit the ocean. Then I saw a wave that was so large It made me freeze in fear. Then the water was coming and people were terrified running and yelling. My wife and I got onto the highest roof nearby and could only pray. It was a random dream not something I was thinking of a lot. Details were very real too. Linda Thompson I had one, but it was on the East Coast not the West. I it I saw waves of water that reached out to the Waterway. I saw the sign that said Myrtle Beach come tumbling down and it wiped out everything that was in its path. Angela Cox Fluharty My reoccurring dream of a tsunami is on the east coast…Myrtle Beach. Tornado is also involved during same dream. Kassidy Dillard Pearce My tsunami dream was at myrtle beach. Shantanna Pierce I have had a tsunami dream too the water’s charged over mountains and city’s under water city’s breaking off and sinking. I have told people and also dreams of nuclear wars right here in USA and yellow stone blowing I’ve had the yellow stone dream sense I was a child wake up 27th lava at my feet. Any body else has any to share.???? Vernalee Smith I have a similar Vision it was an open Vision I was in a church service waves of water coming up on all sides and I heard in the heard the spirit says it’s a tsunami and it was coming from all sides and it flows into the street and into the shores. There were chaos everwhere and an Angel just blowing the wind the country. It appears to be far country. There is more but it was very dramatic for cause that was the first time ever have an open vision like that. That was about five years ago but I remember it as if it was yesterday. Let us pray that this destruction would pass from this country in the middle east, in Jesus name Amen. Colin Wiseman I am a pastor in Avondale AZ, I’m 41 and I’ve been in full time ministry for 17.5 years. I’ve been at my current church for over 15 years(Cornerstone Christian Center A/G) I have been having the exact dream now for over 20 years. Every time I receive them they get more detailed. 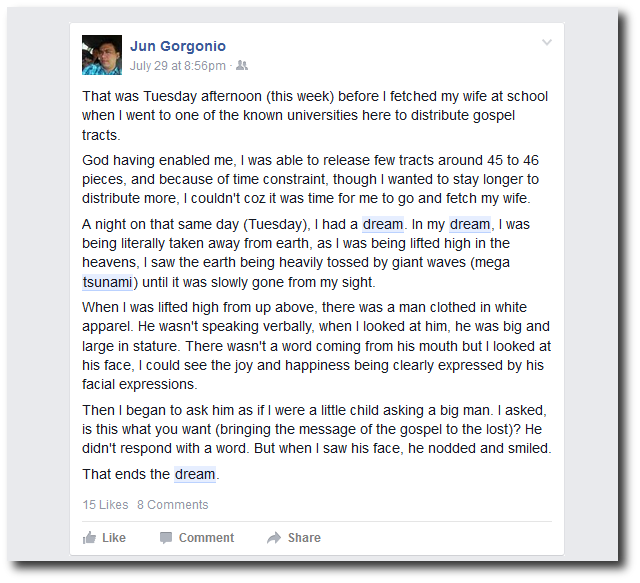 My wife, my friends and my Senior Pastor can attest to these dreams. I recently watched the movie “San Andreas” with my wife and when they showed the tsunami in the movie, I said, “That’s it, that’s what my dreams look like! Glenda Merritt Pittman Years ago a minister said he seen disaster in California. Seen part of it falling into ocean. This was back in the early seventies. I know something is going to take place. Don’t know how or when. April Locklear I’ve had a few tsunami dreams in the past year. I just had one a couple of weeks ago. But in one of them there was a bridge that reminded me of the bridge in San Francisco. Amazing timelapse footage shows a huge wave-like storm – described as a ‘cloud tsunami‘ – rolling towards Bondi Beach in Sydney- Could this be a prophecy of things to come? 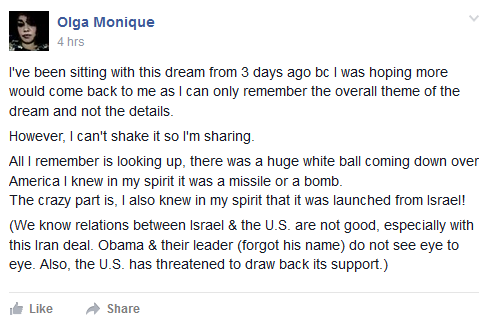 A couple months ago, my give year old daughter woke up one morning and was telling me about her dream. She said our house was under water and she could see eater when she looked out the windows. it really troubled her. the Bible says dreams and visions will be given to our sons and daughters. I feel like it’s a warning dream. moviemakerwannabe Did the dream show you where on the west coast? I had a dream of a Tsunami also. This one I saw from an elevated view point like I do when the Lord takes me in the spirit to see something. I saw this wave coming that was at least 2 stories high ( normally the first wave is not the highest I believe.) As it hit the beach and parking area of a hotel it had picked up a large black truck with those extra large tires and that truck was thrown into the hotel. It broke the glass and came in on the 2nd level of the hotel. The hotel was one with a front lobby with the front window all panes of glass and then there was a balcony or something on the second level that allowed people to be up there and look out on the ocean. This came so fast that I knew the people on the 1st floor had no chance of getting out the ones on the 2nd saw the truck as it broke through the glass and seemed stunned. Some ran but many stood frozen watching. In the dream I felt it was happening in California and I heard the name BaJa. I didn’t know where that was so i had to look it up. In the dream I also felt it was movement of the plates and seemed very much a surprise. The day was beautiful and sunny. I felt this was more of a vision of something real than anything symbolic and later on heard Bob Jones talking about 2 quakes that were to hit specific towns and then would come “the big one” that would be devastating. One of the towns was Mexicali. Mexicali is the capital of BaJa California(the state in Mexico). Ruth Robel I have had a couple of tsunamis too. The first one I had, I did not see any wave. I was like more inland. Where I was, the water just kept rising and rising? I didn’t know it was a tsunami at first, until I saw footage of one in Japan. srevisn3ts I started having a dream about east coast in 2007. My son started having it and came to me. I never told him about me having the dreams. I’ve had quite a few over the years. I moved off the coast back to the upstate in foothills. Honey Pie3 I had a tsunami dream, and I was viewing it from the air. But it was the East coast. Everyone near there was lying dead. 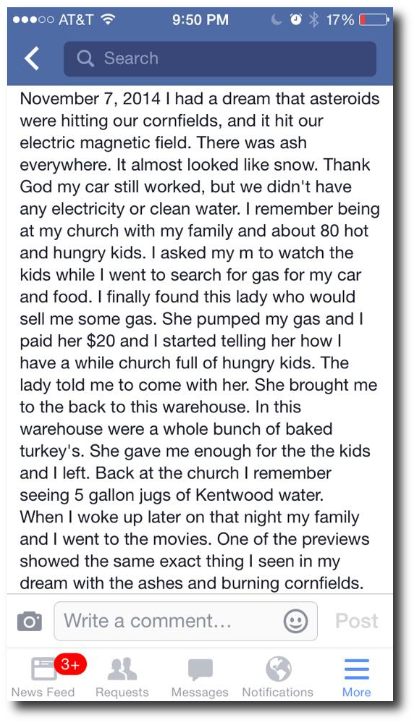 I don’t like sharing such and awful dream, but I do believe it was from the Lord. God bless you! Keep looking up! mspollynicole I’ve been having dreams of much significance over 40 yrs. Had a dream in 1993,where I saw 2 giant angels standing over New York. I told 2 cops. They asked me how big. I said taller than skyscrapers. They asked me were they angels of destruction or good angels. I said I didn’t know. Then they laughed at me. Philip Appleyard I had a dream (last night) after a restless night, that I was in a city near the sea. I was looking over a small wall at the sea. I saw a large wave coming. It towered over the large building behind me. The wave looked literally like a wall. I tried to hide behind a small outhouse before realising that wouldn’t help me at all. I then ran into a very old (it had pillars and looked almost Egyptian) large building. I ran up some steps into the building but it was too late, when I was in the building the wave overtook me. My last sight was the water all around me. I then woke up. This wasn’t a hyper realistic dream like I normally have but looked more like a realistic computer game. Most dreams I have like this are almost more real than real life, but this one was different. Nancy Kuba Like you said, keep it real. I became born again back in the early 80’s. I want to also say I am gay, so you can dismiss what i say & I also am saying my dream & dreams may just be that, but wanted to say them anyway. I had a dream maybe now 2 yrs ago where I was sort of a tourist & was with my sister & my daughter, who was about 8-10 in my dream ( she actually was 19-20 then). We were at a rest stop plateau looking at the mountains & hills around us. We were at a high elevation also, but not the highest. It was circular & had a glass encased billboard that had flyers & info in it. As I looked at the green mountains that were very close together, a gush of water started weaving it’s way towards us. The water was as high as the tall mountains. Again, I’m not saying it was any prophetic dream & I’m also gay. MsNK4U I had a dream of waves. Tsunami or not I don’t know. All I know that one rises up so high and I was above it for a while then came crashing down with it. I believe dreams are an opportunity to pray dynamics away. I also saw a volcanic dream. I don’t know if it was Mt. Fuji or not. But, people were groping through gray and ash . The first dream of disaster’s was back in 1992 . I discounted it in that I didn’t know what was going on I thought I was cracking up. But, ugly God is a respecter of no one. He talks to whoever He wants. Since then I’ve become a believer . I pray it is reversed. . I pray for major continue out break of revival all over . Maybe that is the key. A tidal wave of the Holy Spirit on us to wake up and repent . Then to get snapping with what’s at hand. 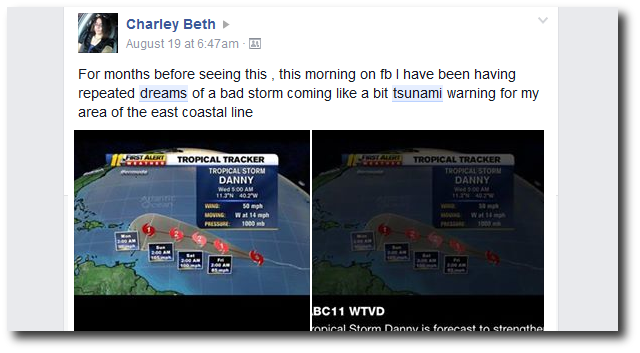 mspollynicole Also had a tsunami dream a couple of years ago. Giant destructive tsunami wave west coast California. IDK when. Never do on some of them. raining without therain About a month ago I had a dream of a tsunami in CA. It was a very tall wave that was allot higher than the buildings. We all started running then it went to slow motion and we stopped and everyone looked up and that was it. Doria Moreira About a month ago right before I woke up, I dreamed I just got up and went to the front door and I looked and at the end of our street there was all of this water flowing real fast down the street and it took down the tree as it was coming by and huge waves higher then any houses and these are big & tall house some waves looked twice as High. I felt scared and thinking, this is it, I am going to die, terrible feeling. Then I woke up, it seemed so real and everything looked like it does in real life on our street here in Houston, Tx. I can’t get it out of my mind, I feel like it is a warning from God. Jonathan Welch phoenix, san deigo, and Hawaii are the places in my dreams that get hit by tsunamis. Sometimes I survive and sometimes I don’t. I’ve been having those dreams for the better part of a decade. Kenny Mead I have not shared my dream with many but my family and a few friends but my dream was I was taken high above the us I could see like a map of this country and agrate earth quake that started in Illinois and went all the way down to Louisiana it split the country in half and there was a grate chasm so wide you could not see from one side to the other and the sea filed it whole city’s fell in to it and there grate tsunamis from at all so and the lord said behind me there will be a grate shaking of this country! Josh Bradley I almost never have a dream that I remember. In the last year I have had a dream about a devastating west coast USA tsunami. It looked as though it was on the Oregon coast. I was standing on a hill and could see it coming into the bay 100’s of feet tall. Cashe Montgomery Yes, I have had several! I have a dream log book. The last dream was a week ago. I seen small things forming upon the earth. And as I stood there and was watching, a big wave formed and came upon the earth wiping out people as they ran for cover. The government was directing people towards the exits. This is the fourth or fifth dream I have had. I’ve tried to tell it to another prophet but I was just pushed to the side with…..yeah GOD has shown him a true prophet some thing similar. GOD is trying to warn us!!!! Those who have ears let them hear! 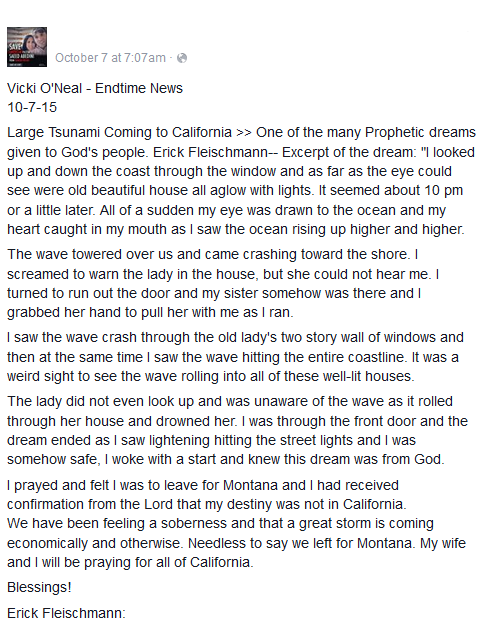 Sheila Anderson I have had several dreams of tsunami hitting both coasts , and was praying Psalms 91 in the dream. The dreams had double meanings. Attack on the church and attack on the country. I have previously shared my dream on Facebook. It was very detailed. God is moving in judgement that is what he told me in the last dream. Hyacinth Branch I had a tsunami dream about a year ago. In the dream people were partying on a yacht. I know it was west coast because my California friends were on the yacht. I saw the wave coming and most of the people on land saw it also. They were yelling to the people on the boat. However the people on the boat were drinking champagne and partying. Oblivious to the coming wave and the people yelling on land to try and warn them. The people on land all started running but the people on the boat were washed away. 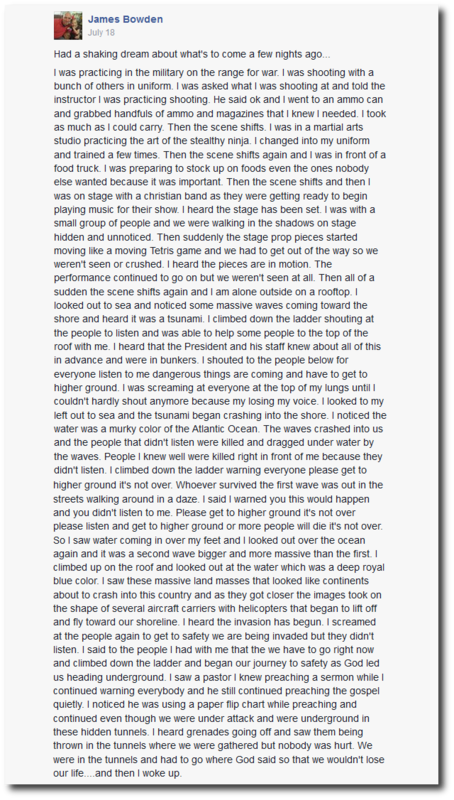 I have had 6 other tsunami dreams but this is the one I feel to share. Brenda Blankenship Graham My late husband, who was a minister, dreamed several years ago that people were on a big boat/yacht and were playing music on the deck. They were warned to go inside but wouldn’t, but the ones that did were up high inside an “upper room” and a large wave came and swept everyone off the deck that wouldn’t take heed to the warning. 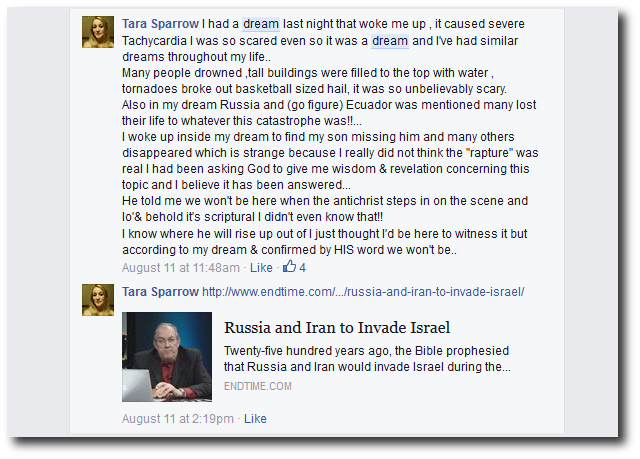 Brandi Carpenter I have had 2 dreams of tsunamis both on the East coast. The most recent was of waves coming across the mountains where we live 70 miles away from Washington DC. Roxy Marie Johnson I too have seen gigantic tidal waves crashing in and crushing all that they touch. I’ve been seeing them in open visions and in dreams, on the coastlines of this nation. I’ve had so many and they’re always the same, and in the dream/vision I am always able to walk on the water to safety as Jesus is the calm of the storm. This dream you had is exactly what I have seen as well. It is correct, and it is coming. Anne Reitzug I had the same dream/vision three times in the space of several months, beginning in August of 2012. I saw only a pure white backdrop with a single word imposed in black, italic letters which read: “preparedness.” Just below the word was a number four in the same font with two close, concentric circles around it. I searched the Scriptures and was not able to fully discern the meaning. The word “preparedness” is not found in Scripture, but refers to the act of being made ready, specifically for war. 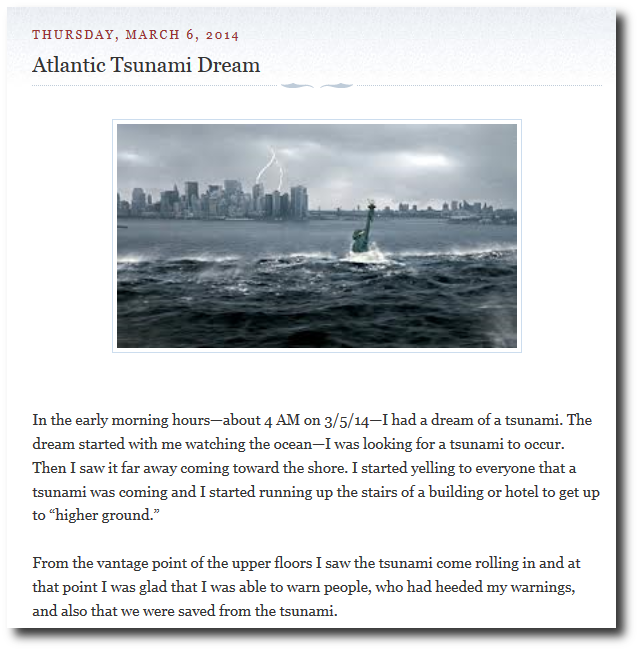 I also had a tsunami dream several months ago, which I sensed was to happen in the US. We have family and friends still in the Seattle area, but have recently relocated to Scotland at the Lord’s leading. Desiree M. Mondesir Yes, I had a dream around last June that I was warning people of a tsunami or some watery destruction headed to New York and reaching as far as Jersey. I wasn’t telling people to move, but to run! I was warning everyone from the area that I knew and also on the phone calling everyone from the area so they could leave in time. When I woke up and checked my email, there was an eBlast from Kim Clement’s ministry speaking of a tsunami coming to New York!! He later prophesied that it would not be in the natural as of yet, but that it was spiritual. Tonya Stairs I also have had dreams like this , in one dream I was told something really big is about to happen . In a different dream I was in the middle of a raging flood and I heard a voice say, “were you slain in the flood of Genesis?”…..I said , “No.” …..then the voice told me something more intense was coming very soon and many will perish . I ALSO had a dream about a month ago of a tsunami that hit the east coast . I could see the entire United States and I saw the wave engulf the entire east coast all the way to western NC. The west coast was colored in white . The east coast was colored in red. I could see this happen from above , I was looking down at a map like image of America . Bonnie Blood Yes. I also saw a Tsunami coming into a huge city. I saw people running to their vehicles to get out of the city but traffic was so heavy they couldn’t move. The flood waters were quickly rising and I told my family we have to get to the mountains, but than I realized we had no supplies and would have to fight off wild animals and freezing cold! I thought at the time it was the end Then I thought to myself, “wait, this is not how the world ends, it ends with fire.” As soon as I thought that, the dream ended. 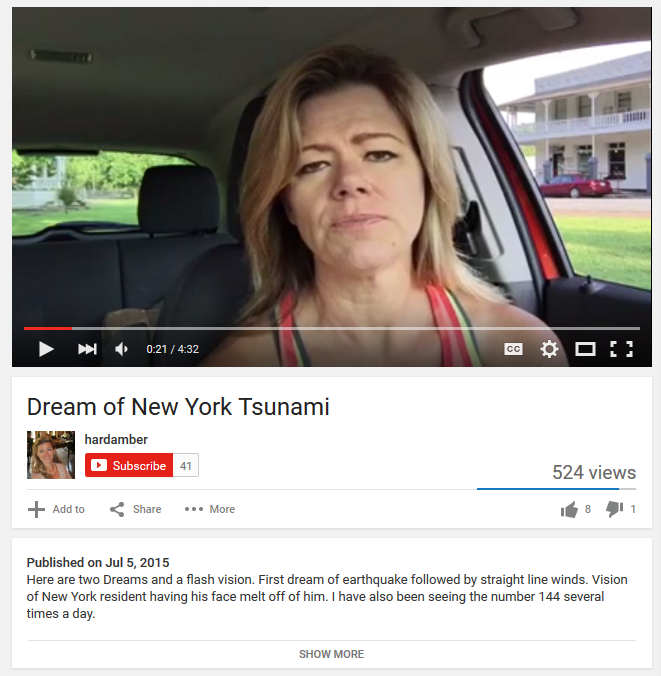 Ann Doupont could be a tsunami dream. When I lived in the Bay Area (all my life till 14 years ago when the Holy Spirit had me move to Boise, Idaho) I was standing at Alameda’s south shore and looking across at the San Francisco skyline, which is downtown SF, and I saw it engulfed in flames...although it wasn’t like real fire. It looked different from that. I was thinking its meaning was spiritual rather than natural. Rhoda Helene Weber 4 years ago I dreamt of a huge tsunami hitting the west coast, similar to yours. I was taken to a higher place and placed in a glass house where I watched the water raise and NO ONE was alarmed. Then about 3 years ago I saw ships on the ocean all coming to the West coast. On the ships aliens… not a single American concerned about this I called the alert and no one listened.. I knew if they were allowed to land it was because judgement had come…. I have had tsunami dreams over the past 10 years along with others. One I wish I could talk directly to you Perry that has to do with a secret meeting that was held… I can’t put it here or speak about it to just anyone. Anita Merritt Greening This is very interesting. I have never had tsunami dreams. I have had dreams of missiles hitting major US cities. The cities were completely blown away. Also, a dream of Russian MIGs flying over the continental US. That dream of the MIGs took place about 4 years ago. I had no idea what a MIG was, and had to look it up after I woke up. In another dream, I saw a giant book. It was unlike any I have ever seen. It was very old but in good condition. Soldiers were looking at it. I looked over their shoulders at the book. The title was Critical Events of the World. I have never seen such a huge book. They opened it, and I saw a couple of dates. I don’t remember the events that went with the dates or the year of the events. One of the dates was March 11th. I pray over the dates every year. Cheynoa Wheeler I had one but its been a couple months back. I was on the East Coast near or at Mrytle Beach in a hotel on one of the side rooms with a balcony. My husband and i were looking out towards the water and all of sudden there was a huge wave that was coming and there was already water coming in and going over the road and hitting cars. People were running trying to get higher. I looked at my husband and told him weve got to get higher. As we were running up the stairs to get higher in the hotel the dream ended. I have also had a dream of all electronic and things that run on electricity go out. These dreams were so life like. Tammy Zito Provencher The vision I have had was of the US southern coastline.I saw the map of the US..and it spread as wide as from East is to West…it came up as total blackness...looked as black as oil…came up from the Gulf of Mexico and moved upward All across the US map then creaped up as high up to bout midway of Tennessee…and Florida was not there….Not sure what this blackness is..could it be a wave or an Tsunami??? What R your thoughts?? Martha Webber I had a dream with a tsunami about a week ago. In my dream a saw the water in the sea turning dark gray and the level of the water went up quickly and suddenly, people around me noticed what was happening but didn’t care. I believe the place in my dresm was either Florida or one of the Carolinas. Vida Soto Chavez I had a dream where I heard someone say water is coming from the east get on sea level .. I live in Brownsville Tx 20 minutes from South Padre island .. I’ve also seen a huge tsunami but this one was in a dream I had with an Tsunami, asteroid,nuke and rapture, all happen one after the other. Patricia Busan Errickson I’ve not dreamed about tsunamis but as I have been reading Jeremiah, I have felt my heart stirred that judgment is coming in waves to our nation and it will separate those who have a real relationship with Jesus from those who have abandoned their service and love for God for the world’s offerings. Nikki Jacobs I have been feeling uneasy and have been praying diligently to the Lord. 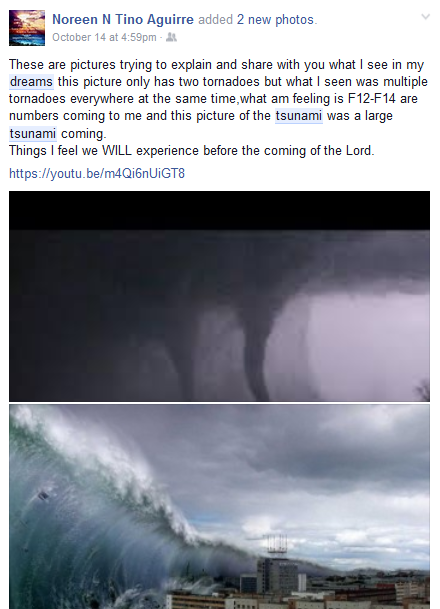 I live in Southern California and believe God is telling me to be prepared… I have had numerous dreams about tsunamis all my life and didn’t really understand it but I do now . Thank you for sharing. GOD BLESS. Medgina Jasmin I have seen and received the warning for a tsunami 2 times. But it was in the East coast though because my familly was affected and we live in Miami FL. And i did receive a KEY date but the year was cut off. It was written in the sky by a group of birds that aligned themselves to form numbers and letters. They spelled out JUNE 26, 20. Jim Bateman I did not have a dream about a tsunami but did have one about a earthquake that was severe. In the dream, I saw a scale that suddenly went crazy and into the red. It never stopped and just kept going higher on the scale. While still dreaming, Father told me that the earthquakes and volcanic activity shall get worse and that yes another “awakening” shall take place but many natural disasters is how it will come about, many will not make it to the awakening and we need to be prepared at all times to stand before our Holy Father. God spoke to me the night before 9-11, saying the words, “Tomorrow will be much terror, on many people.” I was new to prophecy, and did not understand.But the next day, I remembered, and knew what He meant. I was at church, which had been converted into a lounge, with many easy chairs. On the backs of 3 chairs, I saw as if on TV screens, scenes from daily life, suddenly turning to scenes of marching troops and army tanks. I was suddenly lifted up in God’s arms as if I was an infant, and carried right through the ceiling, into the blackness of outer space. I found myself whirling through the universe, crossing barriers of time and space. I was set down in San Francisco, at night, sometime in the future. I was on the street, under the trees, and I was watching large trucks going from house to house, and they were collecting people in secret. I knew to stay hidden from those trucks. Suddenly, I felt to run toward the sea. As I ran, many passed me coming from the sea, screaming in terror. I topped the hill, and saw the ocean, being stirred by a huge unseen hand. The wave began to rise far out to sea, higher and higher, and people ran in terror from it. But I ran toward it. My whole being was so thirsty for that water! I dove into the wave, welcoming being drowned and tossed on the wave. I then found myself in an underground place of incredible peace, where everything was covered with a powdery whiteness. I met people I have known, who have died… and Christians began to gather in groups, and sing together. I woke and asked God what it meant. He told me many things that morning. But one thing is clear: Christians have nothing to fear, even though they may suffer and die for their faith. Persecution of Christians is coming soon, in the US. It will begin in secret. Many things will change very quickly in this country. The end comes as a flood. Many see the end coming, and are trying with much effort, and in much fear, to keep it away… but the end is predetermined, and will come. As Christians, we hasten unto the coming of the Lord, longing to be united with Him. If we die faithful, we will be in a place of much joy and fellowship. There is nothing to fear. Geannerise Joyce My sister and I have both had tsunami dreams. We’ve talked about where we would run if it happens. 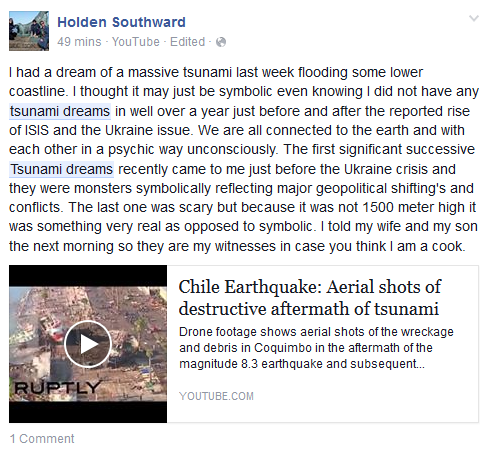 We are being told in the Caribbean about the mother of all tsunamis that is coming. We are in the last days and reading Revelation let’s us know that horrible things are coming upon the earth. The greatest hiding place is Jesus. Period. Can’t put our trust in the Babylonian system. David P. Ward During the 2006 Azusa Street Centennial, I stood at the Convention Center & looked at the Los Angeles Skyline. In a moment of praying over the City during a break between meetings, I had an open vision. It was as if the ground under me had begun to shake. I literally grabbed the handrail on the steps on the front entrance as I watched the Skyline begin to violently shake. I knew this was going to be a future event. We had several people from our church attend the Asuza Street Conference with us. I wept that day, because I knew it was going to happen. Jeff Palmer Back in January I had a dream about a volcano erupting in West Virginia. It was on Mt Storm. Near the lake and power plant. This dream was repeated over several nights. I recently read an article about a plan to build a green energy power plant in that area. A large magma chamber was discovered by gas companies that were test drilling for Marcellus natural gas. It is close enough to the surface that water can be pumped into the ground were it will become super heated steam. And then brought back to the surface and used to power the turbines in a new electric power generation plant. Poking holes in the earths crust over a magma chamber may not be the smartest idea. This is not the first volcano dream that I’ve had. Last year I had a dream about a volcano erupting near Flatwoods. 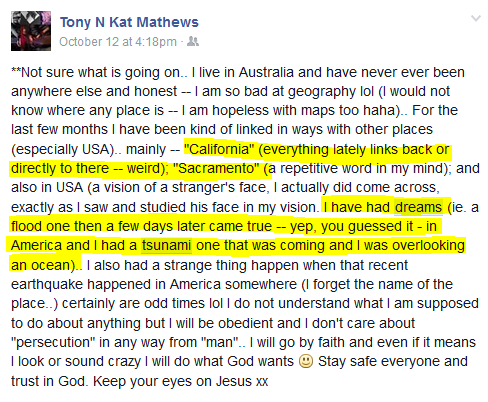 I’ve had a few dreams about floods and earthquakes as well. I don’t know what’s ahead, but it doesn’t look good. 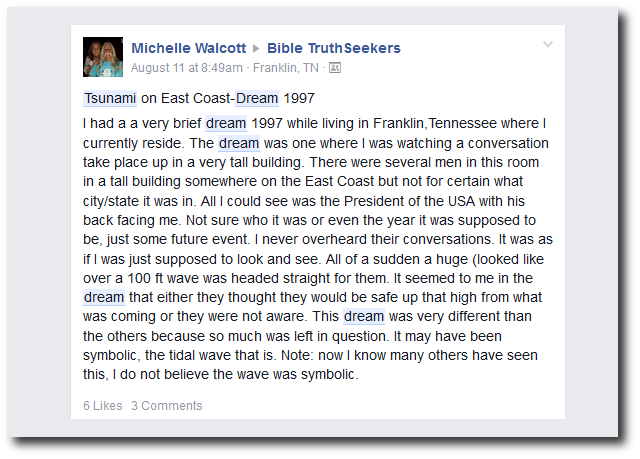 Numerous people at our church have had dreams about tsunamis occurring. Lorie Basler I too have had a dream of waves. I was in a small boat going down a creek that got bigger to the size of a lake. At the end of the lake was a big city. The waves started out small and got bigger and bigger until the biggest one. They were heading toward the city. I got my kids and we got out of the boat and started going up this mountain. There were cars and people who were also going up the mountain however they had stopped at this little water hole where 2 men were in the water practically naked. People were gathered around to hear what they were saying. It’s like they were preaching a false doctrine. It didn’t sit well with me in my spirit so the kids and I kept going up the mountain. Alison Lyles Branch I had a dream of a tsunami last May…2015! I saw the wave rise before my very eyes and is was horrifying! What you are saying is very accurate! Thank you for sharing! God bless you Perry!!! Bernadette Keane I’ve had several tsunami dreams, the last one was strange as there were college students in a high rise hotel on the beach, as I tried to warn them of the rising water they just stayed in the rooms, they had been paid by elite people to be there, no matter how high we went the water continued to rise. Tina Fad I had a dream of a tsunami last month. I dreamt my family and I were running to higher ground because the waves were coming. I live in California, in an area where the water shouldn’t be able to reach us like that. Chris Rushing I have had two dreams in the recent past of fire falling from the sky and catching everything on fire. and before the fire started to fall I heard a sound in the sky that sounded like a shofar blowing. Angela Woodall I see also. The Lord has shown me the water and the waves too. He has also shown me things on the East coast. You spoke of preparation, the Lord gave me a vision to write out on how we are to prepare. Steph Uyenaka I too had a dream of a big storm approaching but instead of rain it rained down fire. The fire burned up everything…crops, housing…there was much crying from those who survived, and very little was left. Carol Fowlkes A little over a year ago while we were still living in North Carolina, I dreamed of a Tsunami, I was with a lot of people up at a high level in a house. Everyone was walking around and visiting with each other, it had been raining for a long time and I knew that the roof was going to cave in so I tried to get the people to leave , but no one would listen to me. I looked out this large window and a Tsunami wave was coming right at the land. We were close to the ocean.,still no one would listen to me. I awoke with this Scripture on my mind, “As it was in the days of Noah , so shall it be at the Coming of the son of man.,,, (paraphrased).. There was another part to the dream which was also a warning but I’ll leave it for another time. Michelle Johnson Chamberlain I had the same dream a few years ago. I was on the west coast (I live in East Tennessee) setting at a little outdoor café. I looked across the ocean and I see see the water was rising. Slowly at first, but then more rapidly. It looked like a huge wall of water as it made its way to shore. I was trying to warn the people but most were just carrying on as usual and ignoring the warnings. Very devastating. 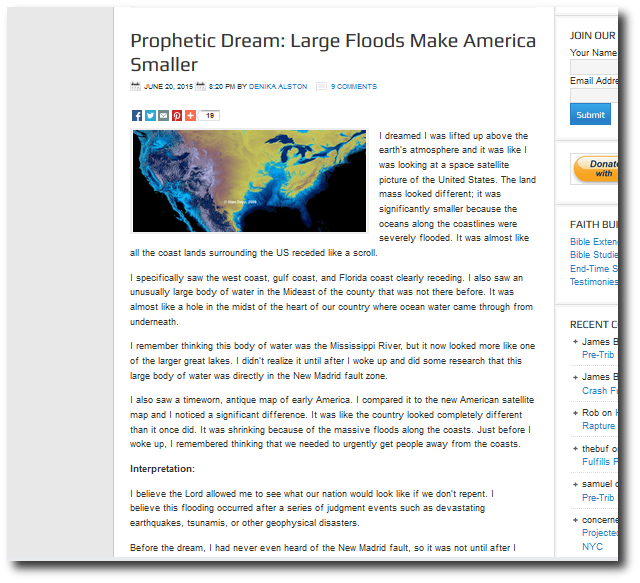 Date – 12/11/2011 Early AM – Floods in California -This night I had a dream that a large Damn in California had damage so the Dam broke. Floods moved all throughout California.Some people who were closest to the Damn were completely consumed by the water. The people mid-way were struggling in the salt water. It continued to move through one city to another city. As they were trying to seal the Damn I could hear the voice of a news castor saying, “Even if they could repair it, it would be years. I then heard specifically 5 years. I was placed in various places as the flood moved through. I could hear the sound of metal bending and wood snapping as I watched the water move through the cities. Date 08-04-2014 California Destruction, Mudslides, eroding shorelines, people in huts, -In this dream I simply saw that, what looked to be the entire coast has eroded away. There was a mudslide. I could see another housing or apartment community that was the eroding and it was drawing closer too. I saw what look to be a neighborhood of tents/ well they were actually straw huts that people had made to shield themselves from the Chilly air and they were coming across the land carrying firewood. While this was happening I could hear the words they are cold. 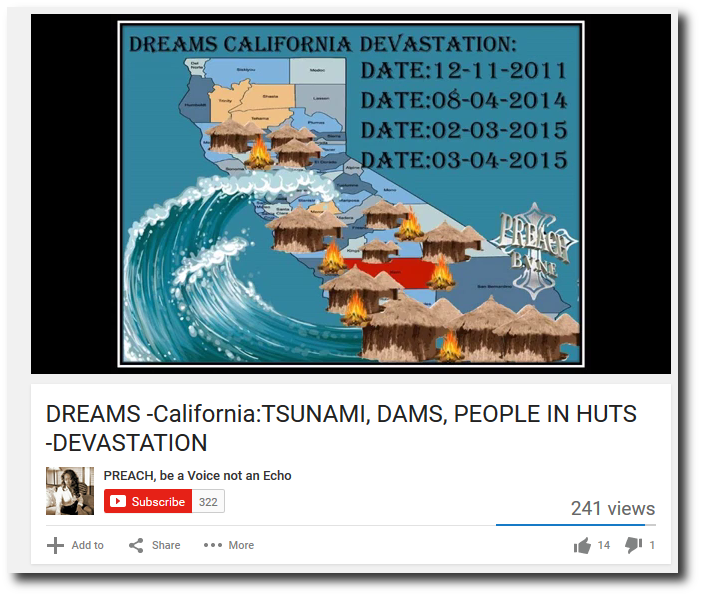 Date: 03-04-15 TSUNAMI , CA People drowning in water_ Second vision on this This dream was short as was the first one like it. There was a Large Tsunami wave and people who were warned and didn’t listen, some laughed. I simply saw the waves as it hit. As always I am put in their place, I feel what the feel and see what they see, all while looking on. I felt the water enter there Lounges as they were sucked under the water, violent water. I could see through their eyes as they looked up from beneath the water reaching for help! I have had this dream twice! As I could feel the breath leaving my body as well, The Lord then Woke me! My first words, Why wont the listen! Jeremiah 7:16-18 16 Therefore pray not thou for this people, neither lift up cry nor prayer for them, neither make intercession to me: for I will not hear thee. 17 Seest thou not what they do in the cities of Judah and in the streets of Jerusalem?18 The children gather wood, and the fathers kindle the fire, and the women knead their dough, to make cakes to the queen of heaven, and to pour out drink offerings unto other gods, that they may provoke me to anger. Jeremiah 11:11(KJV) 11 Therefore thus saith the Lord, Behold, I will bring evil upon them, which they shall not be able to escape; and though they shall cry unto me, I will not hearken unto them. 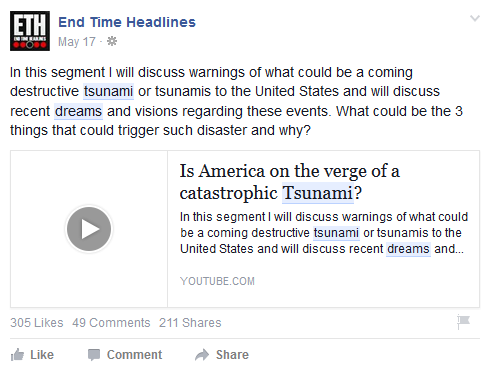 There has been a lot of chatter regarding the possibility of an Atlantic Ocean tsunami. Do I think that there will be an Atlantic Ocean tsunami? Yes! Here is why. More Visions Of Asteroids, Or Russia Attack? My name is Erick Fleischmann. I have been a Christian since a boy. I went to Bible collage in 1991 in CA. In 1995, I was praying for about a year for the direction of God in my life and had a choice to stay in CA or go to MT. I had a vivid God dream of a huge tsunami hitting the coast that towered way over the houses on the cliff. The people were caught unaware and many died. Much wealth was destroyed. In my dream I was standing on a street in a residential neighborhood located on the coast of California. The crickets were chirping and moths flying around the streetlights with a gentle ocean breeze blowing. It felt about 10 to 11 pm in the dream. I looked up and down the street and noticed it was a wealthy peaceful suburb located along the ocean on a high cliff. The street I was on ran parallel to the ocean with great views. I then walked into a wonderfully decorated house with antiques and two story bookshelves on the walls. To my west was a huge panorama of the ocean through a two story wall of windows that went to the peak of the roof. A little old lady was rocked herself in her rocking chair reading contentedly with her cat purring on her lap. She did not see me and seemed to have no cares in the world. As I looked through the window I noticed that her house was one of many on a huge half circle bay to the ocean. I looked up and down the coast through her window and as far as the eye could see were old beautiful house all aglow with lights. Once again it seemed about 10pm or a little later. All of a sudden my eye was drawn to the ocean and my heart caught in my mouth as I saw the ocean rising up higher and higher. Andy Bodfish I had dream, years ago, in which I was building with many other people. We worked as fast as we could. On either side of the wall there was an innumerable number of people. We worked to stop a great wave from wiping out the people who were on the west side of the wall. However, unlike your dream, it was a tsunami coming from the east. I do pray for dreams of confirmation from the Lord, though! Brenda Moon Barnett I remember reading many years ago of prophecies given by William Branham, all came true except one; he prophesied to his son Billy Paul while standing on the streets of LA, that one day sharks would be swimming where they were standing. This is the only prophecy of many that has not come to pass yet. Sonya Kimbrough-Clark About 4-5 years ago I had a dream and it was of the west coast because of the way we were facing. Weird we were on bleachers. I was at the top sitting watching people swim I could see at least one big waves seems like more behind it coming and I knew they would kill, and in this dream I was telling people to get out but seems like nobody listened. As I turned (facing the east) and ran to the very top. At the top it was like a Paris setting little tables with umbrellas and people eating and sipping and a peaceful enjoying the beautiful weather. I believe my mother and Aunt(now deceased) we’re sitting at the first table I saw. The people didn’t have a clue. I felt peace and safety there. But I think I was telling them but they didn’t or maybe couldn’t hear me. I was still conscience and worried about the tsunami. That dream also bothered me awhile. Even now. Marcy Lang I have had tsunami dreams since I was a little girl.. I was not save at that time in fact I was not saved until 2011.. So everytime I would have that dream I would be terrified and wanted to find my family and get to higher ground.. it wasn’t until I move to Las Vegas that I had a tsunami dream only this one was different.. I dreamt it was dark outside and there was no power anywhere I could tell as I looked out the window.. all of the sudden the TV flicked on and a news reporter came on and said there is a huge tsunami coming our way to get to higher ground.. as usual I freaked out and started to look for my family… as I approached the first room I saw there was light but again I thought it was strange because there was no power so I went into the room.. there was no furniture only a white book in the middle of the room.. as I got close I saw it was a bible.. I opened it and started reading it and a supernatural peace came over me and I knew everything was going to be ok.. at that point I woke up..
Sharon Schultz About 10 yrs. ago I saw huge waves carrying boxcars with them off of the west coast of the USA in a dream, and since my son lives on the OR coast I equated it with where he lives. My husband and I told our son this, and it was received so-so. But my husband and I walked the beach and prayed and then buried in the sand on the beach the scriptures that we spoke regarding protection. Sherrie Bean In the past couple of yrs I’ve had several dreams where I was in a state I didn’t recognize but there were deep valleys and very high mountains. The air was heavy with panic as volcanos, fires, tornados and earthquakes erupted in every direction. The flow of traffic (both vehicles and pedestrians) could been seen for miles and miles as people tried to flee the area. Mary Sparks The Lord showed me several waves coming but one was so high that it reached the tops of trees and saw all kinds of animals being sucked into this huge wave of water flooding cities but I did not see the location. It was horrible!! 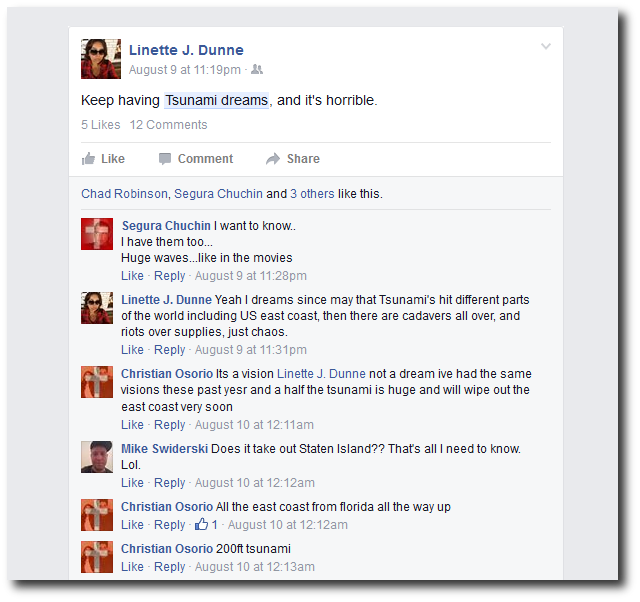 Jessica Cisneros I have had several tsunami dreams a few years back. At the time I was a new born Christian and was new to everything in the bible. reading that others have had the same dreams made me remember. The dreams were all so scary seeing the waves form really high in front of you but in all the dreams, the tsunami was hitting the city and as the waves hit there was water flowing through the buildings in the city and I was looking for a high place and was always safe during the tsunami. I pray the Lord gives us revelation concerning these tsunami dreams. Joyce Narvaez I have had several in the last few months tsunami in San Diego. On 04/30/16 my dream was showing many people fleeing to the Mountains. Good news is our Lord provided 4×4 wheel vehicles so his children could get to the top of the mountain in a quickly time frame. Once on top, it was delightful, peaceful. There was even a pool of water within the rocks that everyone jumped into and rejoiced, giving thanks to him. Rosie Sams My dreams come true! I had dreams I lived by Seattle) about water coming up and up and we keep leaving stuff and going higher on mountain. I seen a kids school bus going high on mountain!! Elizabeth Leckington I am in the Seattle area, and have been for almost 5 years. I have been having dreams of devastating water, as well as being on an aircraft carrier in the water, in the mountains! Sharon Benjamin I used to have dreams of tsunami in happening in Florida when I was in my adolescent years. Never lived in Fl, live in Illinois. Elsa Jurek In the earlyer nineties I had a recurring dream of waves so high that covered the highest building in Long Beach California. Jim Creech In 2002 i had a dream of a tsunami on the oregon coast. The dream placed me in a hotel room on about the 7th floor. I looked out the window and saw a small wave come onto the beach as you would normally see. I again went to the window and see the wave increase in size and come closer to the hotel. This scenario happened four to five times. The last time the wave was so high it engulfed the entire hotel. I woke up after this and without doubt knew this was from the Lord. Since then I have heard the voice of the Lord say that there is going to be a tsunami on the Oregon coast. I have spoken this to numerous people over the last several years to no prevail or a sense of urgency for prayer. My concern is more than the average person because i have two sons and three grandchildren that live there. I would appreciate your prayers. 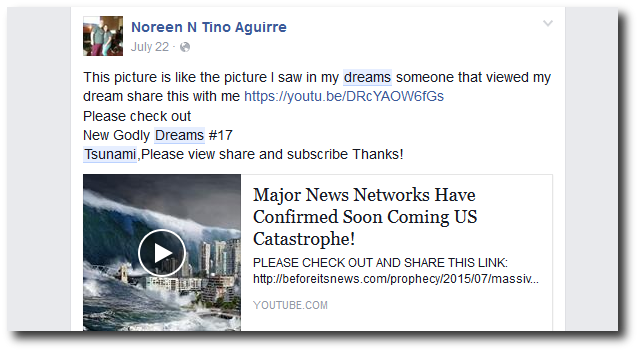 Ann Thea Many dreams…My prophet husband had this one 2/20/16… Pastors driving a car. My husband is in the back seat. They were going on a road because the Pastor said, “I know this road.” He tried for an hour to get the drivers to go a different way. Finally they went North. He saw large red wood trees. Maybe Northern California. My husband saw the tsunami wash inland and make rivers run backwards. Belinda Bradshaw I have dreamed several times in the last few months of floods and getting to the top of the hills and I hardly ever dream . Ana Dotson I have had a total of seven combination on dreams and open visions also on the same area I live by the LAX.same no date except is coming soon . Brian Shannon Arthur Gehegan About a year ago I had a tsunami dream. We were, I believe in Florida, on the beach and I was running around the beach try to tell everyone that the tsunami was coming and everyone ignored me, so I went to the top of a hotel facing the beach and was upset that no one would listen to me. Then I looked out this big glass window overlooking the beach and saw a huge wave coming and everyone had left the beach and they left a small child playing alone, I looked in horror because I didn’t have time to go down and get the little boy. then I woke up…. Taylor Brigance In praise and worship yesterday at my church, I saw a tsunami in a vision. It started small and then grew bigger and bigger till it reached the shore. Gena Mueller Yes but my dream was the East Coast, specifically, NY City. And I knew in the dream that the Tsunami wave was 200 ft.
Ernesto E. Vigil I have had two visions very similar to that, in mine the Lord said to tell His people to go to the mountains. LaShawn N Yates Yes, I have! About 6 or more of those dreams since 2006. I saw something resembling the coast of Florida in one, and in one something resembling the Golden Gate Bridge. Thank you for sharing. Abiel Rosado Had a dream last week of big earthquake of 8.0 or more but I didn’t know where it was . Woke up praying this won’t happen. Angel Locke I have had several dreams of a big wave coming and people running for shelter !! I believe GOD gives us these dreams to prepare and warn us before it happens. Kristen Baird I had a dream a friend and I were walking along a busy type of road and we looked up and huge waves as high as the clouds it seems we’re coming we started to panick and I remember yelling run, then the scene changed to us in a work van and the waves crashed into us but they had turned into the concrete road crashing and we were falling down a huge drop of 100’s of feet, the scene changed right before impact to me in a hospital gown walking with an Iv stand across a busy crosswalk in downtown. It was a crazy dream. Charlotte McDonald I am also having these dreams. However, mine take place near Philadelphia. The wave reaches very far inland. Lisa Takacs-Powell I used to dream of a tsunami over and over again when I was little, I lived in Los Angeles, CA and I saw the water entering my school and I had hid in the restroom and the water could not get me there. I dreamed this same dream for years but when I turned 12 and found my church Eagles Nest, they stopped and I never had them again. Norma Jean B. Martinez My brother lives in Tacoma Washington. 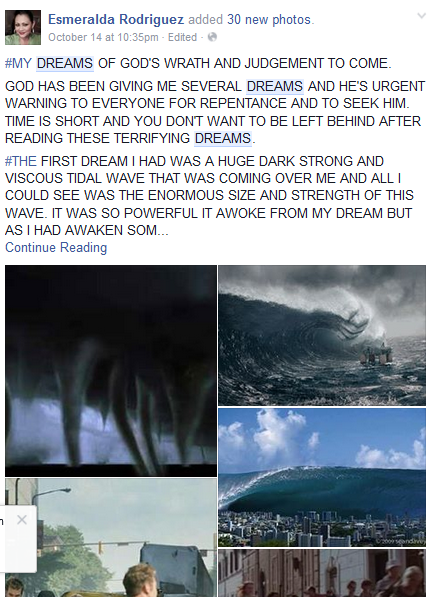 He has had 2 dreams of tsunami’s hitting washington state and corpus christi texas. Eddie N Cedella Kyle Ive had a tsunami dream taking out the entire west coast of america that was now heading towards the east coast of Australia (where i live) i was high in the hills and yet the water came up. It was like it hit just going on dark because of how dark the dream was at this time.. i was disturbed by this dream. The next night i dreamt of going to church under an open tent in a beautiful park area. During the altar call the anointing fell over the crowd in waves where everyone had fallen back onto the person behind them. No one was able to get up. His presence was so strong and His love and mercy just kept on rolling over us like waves in the ocean..
David Lebo My wife and I are founders of Tidal Wave Ministries international. The Lord gave us a vision in 1996 of a tsunami wave sweeping across the United States up into Canada and down into South America. This was an anointing so strong rising up from the depths of God’s people that would be created to destroy every enemy stronghold in its path leaving the glory of God in its wake. We are beginning to see this manifest into the realm of the natural. God is faithful to his word! We have only begun to see the great things that God is about to do! Vanessa Swafford Morales I dreamed I was in a house on the coast. I saw tremendous waves coming into the land and then it overtook the house. I found myself outside in the water and I saw a water board and was able to get myself on it. It took me to a higher house where there was food and water. The water then eventually took that house but I then was able to get on a float kind of craft made for withstanding this kind of storm. I interpret the dream as, there is a storm coming but for his children he will provide safety and our needs will be met. I have had many dreams of floods. Kitt Vermeersch I too had a tsunami dream. Before the wave came, the water along the shoreline was drawn into the depths. I saw God’s people wading in the shallows. His prophets were on the mountain calling for them to flee to the high place. Father was crying out ‘Do you not understand? I have withdrawn my protection. Judgement is coming. Take refuge in Me!’ They did not. Judgement came. Regina Turner I had a dream a while back I saw the tsunami coming as I stood on the beach in Newport California. It was very dark and it was moving very slow I took my friends and drove to higher ground When I prayed about it I felt the Lord say it was coming but not for a time. Also that it was not just for California but the whole west coast from Washington and straight down to Baja Mexico. Morgan Lacey Yes several months ago I had a tsunami dream. I have no clue where I was. I live in Florida so I know I was not here because I was on a very tall green hill watching the wave coming. I was screaming and warning people to brace themselves and to be ready because it was coming. People just went on about their day as if they couldn’t hear me or even see it coming even though it was clearly in sight. I remember grabbing and holding onto a tree as the tall wave came and crashed over us. Then it was gone and another wave came (I lived through both). And that’s mostly what I remember from the dream. Not sure if was spiritual or physical in the significance or if it was just a warning for me for something in my life or if was a warning for others. Although I have had several (what seems to me to be) prophetic dreams, I don’t seem to grasp a full understanding of them at all and not sure what the use was in me having the dream. What was vivid to me from the dream was that the wave was very tall, the hill was vividly green, the people were all distracted and that I lived. But I am reminded that in the days of Noah, people were very distracted, not heeding warning, and perished as a result. God help us. Make us as those crying out in the wilderness… even if others won’t listen… because by doing so, maybe some will be saved. Bonnie Coolidge Parker A few nights ago I had a two part dream that was very vivid. It took place off of the west coast by California and Baja. The Continental shelf literally broke off and fell creating a large tsunami. The second part I was in my kitchen and a shelf there suddenly broke off and fell down. It was as if the second part confirmed the first part: a shelf breaking off and falling. Madelyn Camp Govt. presently setting up for “Land Mass Separation” in U.S. along San Andres, Washington and Madrid fault lines. Prep for infrastructure destruction, power grid shut down. Pray and prepared as God leads. David Byrd I too have had a “Tsunami” dream I was on a coast near some condos. I had walked out onto a small peninsula that had a few pine trees and azalea bushes on it. (I believe they were in bloom.) I was looking at the docks that were between me and the condos which were filled with boats and yachts with the sun shining brightly on a cloudless day. As I was looking at this scene I suddenly saw an ENORMOUS wall of water coming at me from the other side of the condos. I walked out further onto the peninsula and to take a few photographs when someone with me said run!!! We have to get out of here!!! Victoria Nahum I had a dream that a bridge in San Francisco got wiped out by a tsunami. Actually, I don’t know if it was the Golden Gate or the Bay Bridge but it was one of them. Jonathan Castro I have experienced 2 dreams back to back in the same night. I believe it was 2013 I dreamed of something falling into the ocean and creating a massive tsunami in the East Coast.